This is an advertisement for a periodical entitled ‘The Million’. 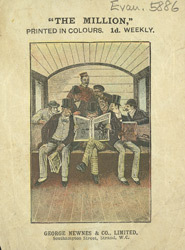 During the 19th century tens of thousands of newspapers, magazines, comics, serials and periodicals were printed and sold cheaply across Britain. There were many reasons that contributed to this new demand for cheap periodicals. Faster and more efficient printing presses had been developed making the production of periodicals much easier, there was a steadily growing number of literate consumers and transport systems such as the railways had been improved making it easier to send publications around the country.